Anxiety or depression is something that we have to deal with on a daily basis. Attempting something new, going for a test or a job interview or even waiting for a test results are some situations that can make us anxious. Anxiety can make us fidgety and jittery, but can anxiety cause heart problems? Many people often wonder "why my chest feels weird" and "can anxiety cause heart problems". Well, anxiety attacks can’t cause a heart attack on their own. However, the continued stress caused by anxiety can damage the heart and might result in the development of other health problem in the future. Moreover, people who suffer from panic attacks and have a heart problem have an increased risk of heart attack but the risk is not that high. Tachycardia or quickening of heart rate: It can increase the chances of sudden cardiac arrest and can obstruct normal functioning of the heart. Elevated blood pressure levels: In chronic cases, it can cause weakening of heart muscle, coronary disease and even heart failure. 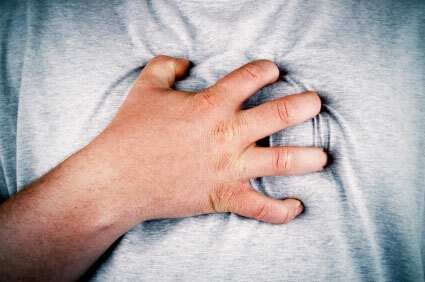 Lowered heart rate variabilitymight increase the chances of death after a severe heart attack. Is It Anxiety or Arrhythmia? If you have the feeling, "my chest feels weird", you may worry what's wrong with you. Although anxiety is not strange to us, but when it is mixed with arrhythmia, things become a little bit blurred. So what's their difference? What does arrhythmia feel like? If anxiety is causing the heart to beat quickly, the increased heart rate always happens after the occurrence of the things responsible for the stressful feeling. If the anxiety is being caused by the heart, then palpitations are usually experienced first and then the anxiety. Sometimes, in this case, people might develop discomfort in the chest or feel lightheaded due to palpitations, which escalate the anxiety even further. Instances of being unconscious due to panic attack or anxiety disorder are very rare. If a person passes out completely, then there is a high chance that it is caused by an abnormal heart rhythm. Most people feel disoriented or lightheaded if they move or stand quickly but there is very slim chance of passing out while performing an activity. It is best to consult with a heart specialist if an individual has experienced a seizure or have become unconscious while doing exercise in the past. Experiencing an unsettling thing and having blood drawn are some situations that can cause a person to pass out. However, if the fainting episode occurs without any warning symptoms, then it increases the risk of cardiac problem. It is common to hyperventilate or start breathing quickly when one panics. It causes a tingling and a numbing feeling around the mouth and in the tips of fingers of both hands. Usually this kind of hyperventilation is induced by anxiety, but if a person passes out, then it can indicate a dropping in blood pressure and an abnormal heart rhythm. Almost all people experience extra heart beats from the lower and upper heart chambers, which feel like a hard or skipped beat. But people feel these extra beats and then their heart rhythm may gain pace as its switch has been turned on. In anxiety disorders, the increase in heart rate is more uniform and does not occur with skipped or extra beats. Heart muscle weakening will happen if treatment is not applied to persistent abnormal heart rhythms. It can cause edema or swelling in the feet, legs and stomach. Strange symptoms like having breathing trouble when lying down and having to use extra pillows to become comfortable when sleeping are experienced in such cases. Increased heart rate caused by anxiety does not weaken the heart and does not result in the development of the above mentioned strange symptoms. Knowing "what does arrhythmia feel like" and "can anxiety cause heart problem" helps you better ,manage your conditions. As you all knnow now, being anxiety makes you tense all the time, affects your efficiency and does harm to your health. So now let's find out how to reduce anxiety. When you are feeling anxious, take a deep diaphragmatic breath to reduce your anxiety by activating the relaxation response of the body. Practice deep breathing by inhaling slowly to fill your belly and your chest. Hold breath for few seconds and exhale slowly. Anxiety can cause you to think or worry about ridiculous things which are either unreal or highly unlikely to happen. Therefore, it is best to keep deliberating with yourself and reminding your brain that what you are thinking is baseless and there is nothing to be worried about. Anxiety can force the people to think about the future which furthers their stress. In such situations, it is best to live in the present and focus on what is happening around you as it will help you in managing the situation better. Practice visualizing calm things like sitting on a river bank or a park and watching the clouds and winds passing by to help calm your mind when feeling anxious. Assign your emotions, sensations and thoughts to the winds and clouds and imagine them floating by. Not sleeping properly can have an impact on your physical health and also increase your stress and tension. Try to make a schedule and sleep for at least 9 hours per night to reduce your anxiety levels. Worry about "can anxiety cause heart problems"? Smiling solves that. Laughing and smiling are among the best means of reducing symptoms of anxiety and stress. Thus, if you find yourself in an anxious situation and afraid that may affect your heart, try to take a break and watch some funny videos on the internet to calm your nerves.